Recent release “The Comic Book Bandit: Stories from a Life of Lies” from Page Publishing author Jay Michael Feldman, M.D. is a passionately crafted work that uses stories from the author’s early childhood to highlight the effects of lying on the quality of life. The story is a heart-warming thriller where beloved little Jay finally ends up trapped in a lie much too big to handle. 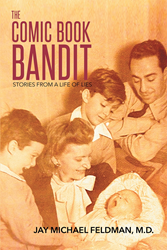 Jay Michael Feldman, M.D., a semi-retired psychiatrist and psychotherapist, devoted writer and author, has completed his new book “The Comic Book Bandit: Stories from a Life of Lies”: a gripping and potent work about a small boy named Jay and his discovery of the power of bending the truth. Published by New York City-based Page Publishing, Jay Michael Feldman’s telling work includes the stories of his childhood told with humor, pathos, and love for family, friends, his readers, and life itself. The stories take place after the Second World War. Yes, the bandit faces the obstacles of grown-ups but cleverly discovers the slippery power of the believable lie. He creates a secret life of his own and shares an acceptable version with those he must account to: his mother, his father, his brother, his teachers, and his friends. Getting away with stuff starts to become second nature, at least until and when he creates a lie so big, with burden so weighty, its effects are at times overwhelming. The culmination of his struggles with the Great Bar Mitzvah Caper will have the reader riveted to each and every page. How could he? How does he? Will he or won’t he? Those are the questions. Readers who wish to experience this profound work can purchase“The Comic Book Bandit: Stories from a Life of Lies” at bookstores everywhere, or online at the Apple iTunes store, Amazon, Google Play or Barnes and Noble.